I received a super-fun “adult” coloring book for Christmas, complete with a rainbow of sharpened colored pencils and spare time to dive in. Rare free time + a remembered coloring book = endless amounts of potential!! Did I just transform care-free coloring into a duty? A responsibility? Another “checked box” on my to-do list? Jesus save me from myself! No. I wouldn’t let this turn into a task! All I needed was a little pep talk and I’d be right as rain (or “Purple Mountain Majesty” Rain, for you coloring enthusiasts! I mean, who could forget the debacle of that name shame?) I reminded myself how coloring is for relaxing and providing a creative outlet, speaking slowly and sweetly to myself, as to not scare the spreadsheet-lover trapped inside my body. Ah, yes. I DO remember this “fun” you speak of. Now I am back on track! Cup of coffee within reach, a beautiful mountain view, my fav playlist in the background. I lay on my stomach and spread my array of colors out on the carpet- this is going to be awesome! I can’t get a great angle like this…My arm is falling asleep…Should I do find a table to get better results?…How can I be a true artist whilst splayed against scratchy carpet, arms confined to elbow length movement? What would become of my lines? My shading technique?! Within moments, I had lost my zen. This was not a contest, nor was it for display in an art gallery. It was a chance for me to be chill with no restrictions, but I found I couldn’t function. I couldn’t let go. My brain couldn’t relax its self-imposed standards. Obviously I needed more coloring and less rules in my life. I know I am not alone. 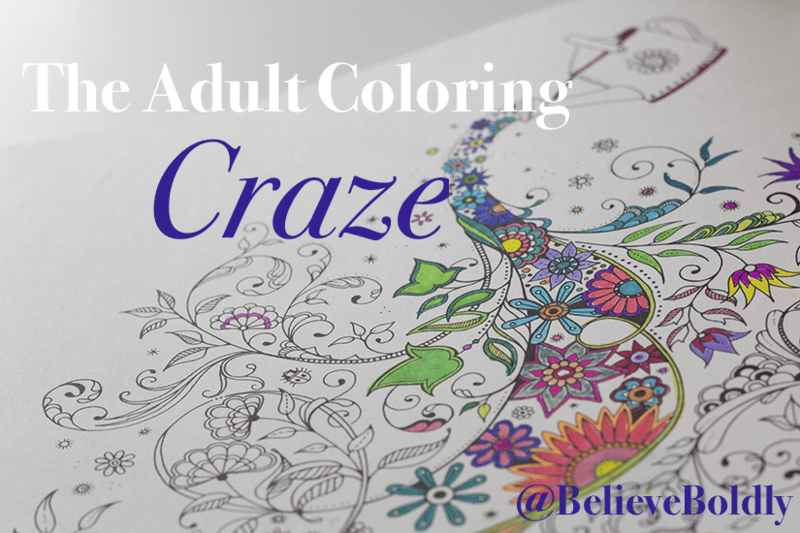 So why the craze for coloring? I think my attempts to become Picasso explain it perfectly: We all feel the pressure to produce the BEST in all things we attempt. Our generation has access to abundant resources through the internet and the Holy Grail, Pinterest. Before us is a world of answers. We can learn anything- from fixing a hole in the wall to understanding the deep intricacies of a black hole. We have been trained and raised to believe that we can (and should) do anything we put our mind to, even something as simple as coloring. When I searched “How to use an adult coloring book” on Google, I uncovered 5,640,000 results. What has this world come to, that it needs lessons on how to put pencil to paper? Fox News says adults like coloring because it creates a “break for the part of the brain that produces fear.” We are all so terrified to miss the mark that we have now turned to coloring to cure our anxiety? What does this say about our ability to relax without assistance? We can’t seem to do it. We feel the pressure to perform in all circumstances and we would like a break, please. We sense the need to engage only in activities that produce “results.” God forbid we take two minutes to ourselves to simply breathe. My generation is crying out for a much simpler time, when we climbed trees for fun and stayed up late looking at the stars. No cell phones and no internet. We long for moments of deep emotional meaning rather than measurable outcomes. We need freedom to create and learn without someone timing us or analyzing the results. Can we stop controlling the things that, in their very essence, are uncontrollable? Creative expression. Connecting with our children. Loving others. Conversations with God. We set guidelines and rules and expectations. We want someone to validate that we aren’t “wasting our time” in our endeavor. We long for moments of deep emotional meaning rather than measurable outcomes. Today, let’s break the rules. Grab your favorite shade of Caribbean Green. Scribble outside the lines. Only use the colors you love, not what is required. Banana Mania trees. Cotton Candy sky. Sit back and enjoy your work. Hang it on the fridge or throw it in the trash. It doesn’t even matter. If you can relax in little ways every day, your mind will begin to relax and create. Let the dishes go undone a day. Have a dance party with your kids without taking one picture. Kiss your husband passionately and follow his lead to whatever comes next. Let’s live the way God intended: fully indulging in the good things He has given us. 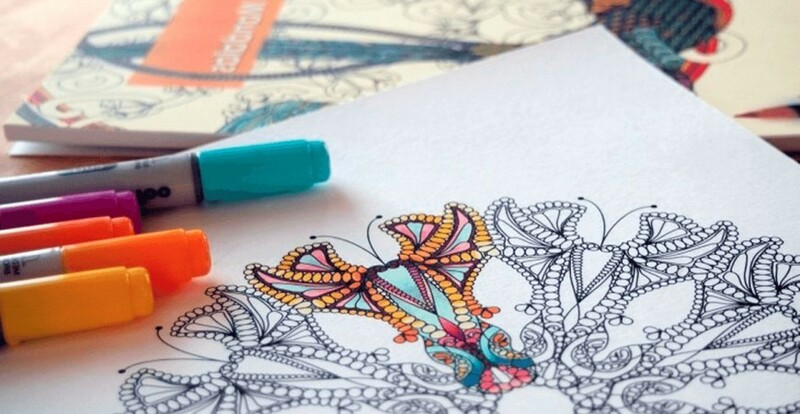 Who knew coloring could save our lives? “My generation is crying out for a much simpler time, when we climbed trees for fun and stayed up late looking at the stars. “….. This is not a generational problem. It is an “everyone” problem. 🙂 GREAT writing, young lady! Yes, yes, yes!!! Love this!!! So glad you wrote about this!!! We all do this to ourselves and the madness needs to stop. Love you!!! I just finished a book by Sybil MacBeth called “Praying in Color.” I love the concept of using the coloring time to still our minds & focus on prayer. As you jot down names, thoughts, feelings, needs & anything else that floats through your mind, you color & doodle around them. Sometimes you just color & doodle but nothing specific comes to mind. It’s simply time spent with God. That is so great! Thanks for sharing how it can be used as a prayer tool as well!